The Cast: Then & Now. 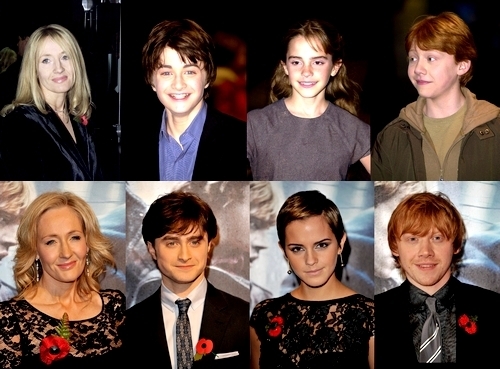 They have all changed so much since the premiere of the first film!. Wallpaper and background images in the हैरी पॉटर club tagged: harry potter cast daniel radcliff emma watson rupert grint j.k. rowling 2010. This हैरी पॉटर photo contains बिजनेस सूट, अच्छी तरह से तैयार व्यक्ति, सूट, पैंट सूट, pantsuit, पैंट्सट, अच्छी तरह से कपड़े पहने व्यक्ति, सूट, and कपड़े का सूट. There might also be सुस्त सूट, ऊपर का कपड़ा, overclothes, ऊपरी वस्त्र, ओवरक्लाइट, दो टुकड़ा, दो पीस सूट, लाउंज सूट, दो टुकड़े, and दो टुकड़ा सूट.